The heat all over most of the U.S. this past week has been oppressive. It's been so hot here in Southern California that the mere thought of turning on the grill to sweat even more while I make dinner holds absolutely no appeal. That's a drag because it wouldn't be summertime for our family without barbecue chicken. Thank goodness for one of my favorite pieces of kitchen gear, the crock pot! Now we get to enjoy BBQ without me having to go outside and stand over the grill in 100 degree heat. All I do is place the chicken and sauce in the pot, coat it well, cover the lid and within 2 1/2 hours I've got chicken that's so juicy and tender you won't believe it takes so little effort. 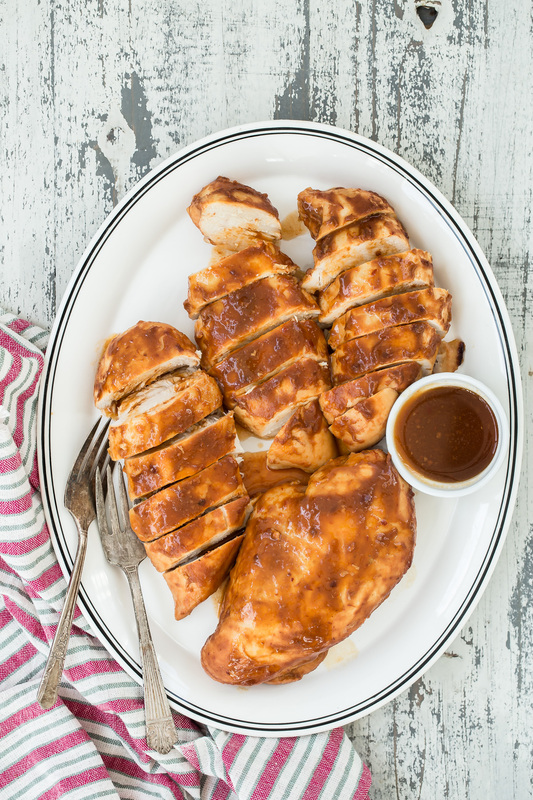 You can absolutely make your own Basic BBQ Sauce to go with this recipe, but there are so many great varieties on the market containing great ingredients so you can save yourself even more time by using a bottled brand. With the kids running around out of school and tons of summer activities to attend, I'd much rather be spending the few free moments I have with the little ones than in the kitchen. And this way, no matter how hot it is outside when you put this Crock Pot BBQ Chicken on the table, everyone inside your house will think you're cool. 1. 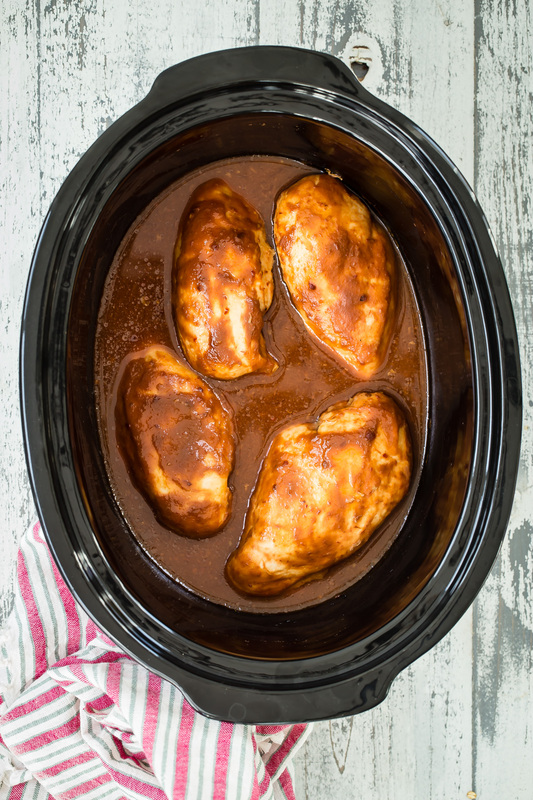 Place the chicken in a crock pot and pour in the bbq sauce to coat well. 2. Cook on low for 2 1/2 hours. 3. Save the juice from the bottom of the pot to make Shredded BBQ Chicken Sammies. How long would you cook a whole chicken (4-5 lbs) in this recipe? Normally with out Chicken in a Crock Pot recipe, I cook it on high for 2 hours for a 4lc and 2 1/2 for 5 pounds. IF you want to cook it on low - I would cook it for 6-7 hours. Can you buy Smokin' Willies in the store or do you have to order from the Smokin' Willies site? I buy Smokin' Willies at Whole Foods. Liz, I put a whole chicken in for about 6 hours. I have done it for the whole day while I am at work (about 8.5 hours) and it was delish, but fell apart...every little bone was seperated. It was still super yummy, but I had to make sure I was extra careful about getting all the bones out. I'm with Meg, I didn't see a store locator that sold the product on their site so not sure if you have to order online directly? Anyway you could do this for a longer period of time, for example 8 hours while I'm at work? You could do an entire chicken for 6-7 hours, with the skin off. It is going to be hard to take the entire skin off the chicken, so I would just take the skin off the breasts and cover the whole chicken with the sauce and set it on low. Vicki~ I've put frozen meat in the crockpot just adding a few hours to the cooking time and it came out juicy and delicious. Though, 8 hours might still be too long - resulting in the same issue others mentioned with the bones falling apart completely. It still might be worth a try, though 5-6 hours might be the 'right' cooking length. The only problem is this is that your food is not going to stay hot enough for food safety purposes. The newer models have warm settings, but I still find these tend to overcook. I love that this recipe actually says too cook for only 2 1/2 hours. Those \"cook for 6-8 hours on low\" recipes just don't work well with today's cookers! They have them! It's a matter of placing frozen meat and ingredients in the crock pot; therefore, calculating the time needed to cook at a semi frozen rate. Keep an eye out in stores. My mom purchased one last christmas for me! I really like crockpot recipes. I like the idea of letting your dinner simmer away as you attend with the other things in your to-do-list. I'd suggest you try using chicken legs or thighs. I find them more flavorful, chicken breast tend to taste too bland for me. After using the original recipe several times and loving it, I tried using Hot Wing (aka Buffalo) sauce instead of BBQ sauce. What a winner! My toddler son and husband LOVED it! I cooked it longer so it fell off the bones, added a dab of lowfat cream cheese and melted cheddar on top, and wa-la. I can imagine tons of uses for the leftovers - Buffalo chicken tortillas, nachos, topping for baked potatoes ... the list goes on and on. Thanks for the inspiration. This recipe is so easy and so good. My husband likes dark meat and this comes out incredible with chicken thighs. I've never had enough leftovers to try anything else. I have 8 breasts instead of 4 and they have skin on. Should I just do it on high instead and for how long? Are they bone-in? I suggest cooking it on low for 3 hours, and depending on how big your crock pot is, rotate the chicken breasts from the bottom layer to the top so all the breast cook evenly. One trick I use for cooking bone-in chicken pieces in the crockpot...crumple up several pieces of aluminum foil and place on the bottom of the pot. Then lay the chicken on top of it. The pieces are elevated about an inch and aren't floating in the juices and falling apart on the bone. I do this with drumsticks that I coat in spices and they come out perfectly done! I do everything on low for anywhere from 7 to 9 hours...depending on what time I get home. I can't wait to try it with the BBQ sauce! This might be a dumb question... but are you always supposed to cover the food in a crock pot with water? I JUST got a crock pot and have only used it once to make a roast. And I was under the impression that everything you cooked in it had to have water added to it. Sorry... I am a newbie! This was so simple yet so good. I used boneless, skinless chicken breast. They were still slightly frozen when I started, so I put them on high for 30 minutes then turned it to low and ended up cooking them about 3 hours longer, just because we had plans before dinner. They were so good! Made BBQ sandwiches with them. Some said the boneless chicken is too dry, but I love it that way so this was perfect. I've made this recipe twice this week with two different BBQ sauces and it has turned out great both times. Now I am hunting for other sauce options for chicken breasts in the crock pot. I assume a teriyaki sauce would work great but what about a pesto? Or some kind of lemon juice and garlic mixture? I would love to hear more recipes along this line. Thanks! Excellent items from you, man. I've understand your stuff previous to and you're simply too excellent. I really like what you have got right here, really like what you're stating and the best way in which you are saying it. You're making it enjoyable and you continue to take care of to stay it smart. I can not wait to learn far more from you. This is actually a tremendous site. I want to make this for dinner but would like to incorporate some veggies into the mix. Any ideas of a veggie I should add with the chicken -- or would that ruin the flavor? Thanks!! This sounds and looks so good and easy. I am going to make it for dinner tonight!!! 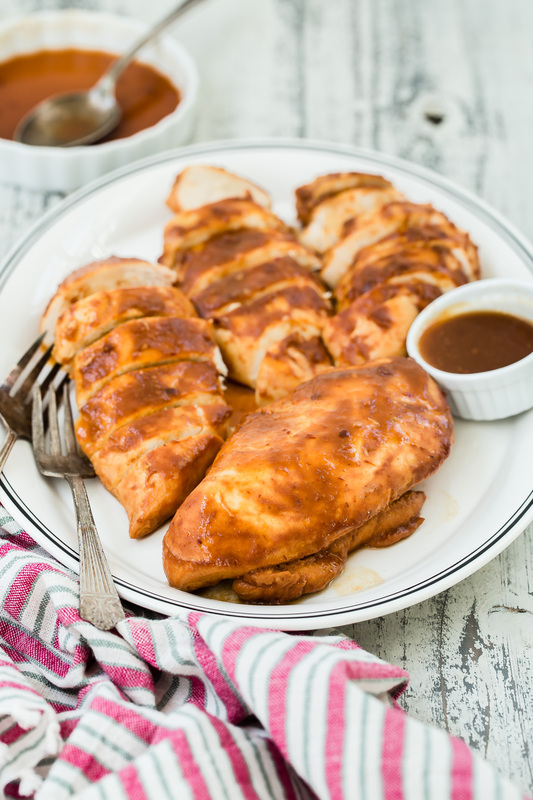 I found a similar recipe on allrecipes, but that one added italian dressing, worcestershire sauce, and brown sugar, in addition to the bbq sauce, and called it \"zesty slow cooker chicken barbecue.\". Yours is simple and delicious, but i thought i'd share. The Absent Game In between me and my huabsnd we've owned additional MP3 players through the years than I can count, together with Sansas, iRivers, iPods (basic &amp; touch), the Ibiza Rhapsody, etc. But, the last few decades I've settled down to one line of players . Hi! I just put in three boneless, skinless chkn breasts with some bbq sauce today at noon on HIGH. I was wondering ... I have made these multiple times but have always cooked them on HIGH for 4 hours. Is this too long? I can't imagine cooking them on LOW for only 2 and a half hours and them getting done. Not doubting you, I just can't imagine that. Really? They will get done in that amount of time on LOW setting? Thanks! Yes, they will cook all the way through! If you aren't sure you can stick them with a thermometer and see that the temp reaches 165 degrees Fahrenheit! Or cut into them to see that there is no more pink. I use Sweet Baby Rays I call it with a twist because I add brown sugar I do this on my ribs and chicken, making sure I have a enough sauce to put in a bowl on the table for anyone who wants to dip or add more sauce because it is thicker and not so broken down which happens when cooking. My family and friends love it . Let me know if you try this and what you think hope you enjoy! Can you freeze slow cooker chicken cutlets, if they are kept whole?